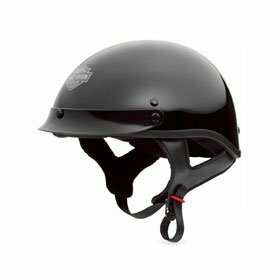 This classic matte black half helmet provides the ultimate in minimalist cool. Its clean lines are interrupted by the silver-colored rivets on the side and the classic, subtle Harley bar and shield logo on the front. This helmet is made of a thermoplastic shell and features a chin strap with D-ring for a snug fit. It meets DOT standards and weighs in a slight 2 pounds. This type of helmet provides protection for the rider who likes to experience the elements -- a half helmet provides more wind and noise than a full-face model. Ordering a helmet on the web can be tricky -- you don't get to try it on to ensure a safe fit before purchasing. For that reason, I'm linking to a third-party vendor (selling via Amazon.com) that provides top-notch customer service. Here's a half helmet offering for the ladies by AFX.